Remember, a percent means "per 100." For example, 35% means 35 out of 100. This can be written as the fraction 35/100. 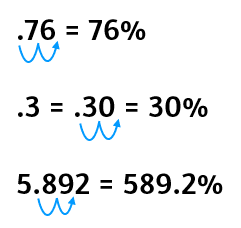 We can go the other way around and rewrite the fraction as a percent. If we have 28/100, that means 28 out of 100, which is the same as 28%. 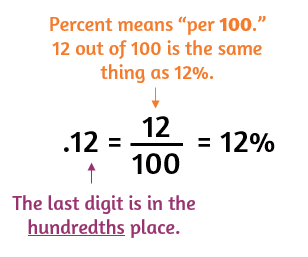 ​If we can get the decimal written as a fraction with 100 as the denominator, the top number will be the percent. You can rewrite the decimal as a fraction first if you want to change it to a percent. You might have to multiply or divide the numerator by a power of 10 if your decimal doesn't end at the hundredths place. ​There's nothing wrong with this method, but there is a faster way. Did you notice a shortcut? .12 = 12% and .371 = 37.1%. What do you notice about the decimal point? It just moves 2 places over to the right! You can use this shortcut each time to change the decimal to a percent. Just move the decimal over two places to the right. Here are a few additional examples that use the shortcut method.